Hello, and welcome to our website about Hereditary Hemochromatosis! My name is Dr. Eric Lewis and I am a Naturopathic Doctor (ND). And just like millions of Americans and individuals from around the world, I have hereditary hemochromatosis, or iron overload disease. 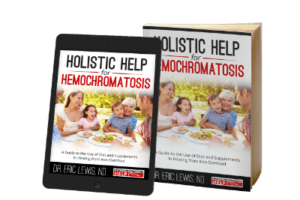 The goal of this site is to provide help to people suffering from hemochromatosis to help you and your family find answers and restore health. As a husband and father with hemochromatosis, I live it, learn it, and try to help it. And to a certain extent, I can walk in your shoes. I know the pain and fatigue that too much iron brings. I've experienced changes in my emotions, the up-and-down moods, foggy thinking, and inability to relax or sleep due to elevated iron. Fortunately, I've benefited tremendously from the recommendations that I will share with you on this site. I don't want Hemochromatosis to stop me and I don't want it to stop you either! There is so much more we can do to feel better and improve our health! I am passionate about life and I want to live it to the fullest! As anyone with iron overload knows, having support and understanding from your family and friends is key to maintaining a positive attitude and quality of life. I'm grateful to have my wife not only be a supportive spouse, but also a trained naturopathic doctor! Dr. Kristina Lewis been instrumental in the research and development of many resources and information on this site, not the least of which is authoring Hemochromatosis Help's low-iron cookbook, Cooking for Hemochromatosis! As Naturopathic Doctors, we have a holistic mindset when it comes to health and well being. Naturopathic Medicine is all about understanding the underlying cause of disease, as opposed to just treating the symptoms. Therapeutically, Naturopathic Doctors strive to support the body's natural and inherent ability to heal itself. We are experts at integrating the science of medicine with the art of holistic healing. We also listen. We hear people's stories... their successes, their failures, and their questions and struggles. We try to understand what is unique about each person's story. And in hemochromatosis, our stories are all very different. Understanding how the body works as a whole- how the metabolic, hormonal, digestive, nervous, and immune systems function together is critical for understanding a condition like hemochromatosis because iron overload can impact our bodies in a wide variety of ways. In a day and age where doctors are trained to become more and more specialized, we are losing our holistic view of health. While doctors are brilliant about all the (small picture) details... we try to see the big picture. Our holistic approach to hemochromatosis makes our perspective unique. Education has always been a major priority, and being a reliable resource is essential for a topic as serious and wide-ranging as hemochromatosis. My wife and I are both honors graduates holding Doctorates in Naturopathic Medicine from the Southwest College of Naturopathic Medicine in Tempe, Arizona. From my undergraduate studies, I attained a Bachelor of Arts degree in History from Emory University in Atlanta, Georgia and Kristina attended Davidson College in Charlotte, North Carolina, also attaining a Bachelor of Arts degree in History. 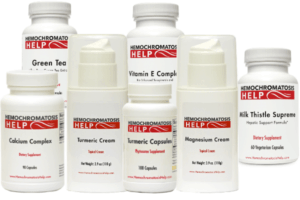 We want to support, educate, and help you understand hereditary hemochromatosis and its causes, symptoms, treatment, lab tests, diet, and supplementation strategies available to you. We strongly feel we should integrate the science of medicine with the art of holistic healing. This is the most comprehensive, and successful, approach to finding the best solutions for better health. We will do our best to help you sort out what makes sense and what doesn't make sense (and what are the scams to be sure to avoid!). We're all different, but we're all one. Let's do this together! Hemochromatosis Help is here to help you find answers and restore health when facing iron overload. To get started on your educational journey of hemochromatosis, read the following articles to familiarize yourself with the condition of iron overload.